Here's a Friday puzzler for you. Update with answer coming later this evening. UPDATE TO THE PUZZLER: ...AND THE ANSWER IS.....JEEZ, I WAS JUST GOING FOR BATFISH, BUT THEN YOU NERDS STARTING BANDYING ABOUT "POLKA DOT" AND "SHORT NOSED" ....THIS PHOTO IS TWO YEARS OLD AND THE ANGLE ISN'T GREAT FOR CHECKING THE FINS FOR POLKADOTS. 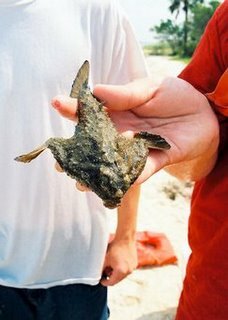 MY UF FISH SITE SAYS THE POLKA DOT BATFISH IS RARE...THESE GUYS ARE VERY COMMON AT CEDAR KEY...I'M LEANING TOWARDS SHORTNOSE, BUT IT IS DEFINITELY A NICE LITTLE BATFISH. WE DID RETURN HIM TO THE SEA AND HE HOPPED AWAY. THAT'S RIGHT, HE HOPPED AWAY. SLOWLY. YOU CAN WALK UP TO A BATFISH AND PICK HIM UP. I THINK WAYNE GETS THE 'FIRSTEST WITH THE MOSTEST AWARD ON THIS PUZZLER. GOOD BACKUP FROM THE REST OF THE ICHTHYOLOGISTS WHO COMMENTED. DYNAMIC DUO = BATFISH AND SEA ROBIN... I need a sea robin pic. My guess: it's some kind of fish. I want a prize if I'm correct! I think it's a dried up toad fish! Remind me never to accept "Beef jerky" from you! Maybe even a polka-dot batfish! Do I get any crackerpoints for that? I'm with everyone so far; some variety of Pisciformes that I don't have here in Minnesota. It is a fish and I have caught them but I will be darn if I can remember the name. I'm going to agree with the smart ones who have answered here already. It's a batfish. I feel like I'm cheating, but I read their answers and I did not have one of my own. Hey, RD - only *one* person answered "batfish". I want them crackerpoints! It sort of looks like a Sea Robin. The head is a little flatter though. I've caught a few of them over here in the river. They have a real hard, bony head. Some get a lot bigger than the one in the picture. Toadfish have a rounder head and big mouth. I don't know about a bat fish. Whew - for just a brief moment I thought Kevin might have scooped me, but no, those crackpoints are mine! A mutant rockfish? A baby coelecanth? A radiated mudskipper? A piece of bark from the Yum Yum Tree? I give. Are they ex-students beause it ate them? It's a fish, that was easy! It's a short-nosed batfish (Ogcocephalus nasutos). I can't see it very clearly in your picture, but if the pectoral fins are polkadotted, then it's a batfish. And if the fins are plain, then it's the shornose batfish. I think batfish wins. I've never seen one, but thanks to you and google I have. The sea robin's head is longer and more narrow. Whomever identified first, good eye. Who knows. I was wrong about the fiddler crabs! Really, DPR - you know very well that FC's slumming over at the Bums while everyone here is sweating bullets trying to figure out his puzzle. Since I updated with the answer, I'm doing a "blanky thanky" as the Pirate would say. I want you to know, it was a busy day and I really needed the laughs from your back and forth banter...it even spilled over into that hippy blog...which probably confused a few of the Bums nonPureFlorida reading commenters. You made my day. I thank you again. Well it was a lot of fun - thank you! I hope the hippies enjoyed your company. I was all set to say batfish, really I was, even before I saw the answer....despite the fact that I live WAY inland in upstate NY...unless you count the river. Well, too late for the game, but I would never have known anyway.... thanks for another valuable lesson! Still good to hear from you even if you missed the batfish carnival. Well, I knew it too dangit. Foregone conclusion...I knew you knew it.